You may have heard of the Three Bears before… but we bet you never knew they were this cuddly and cute! Our Giant Teddy Cozy Cuddles 3 Bears Family comes with 3 bears: 4ft Papa Bear, 3ft Mama Bear and 2ft Baby Bear. 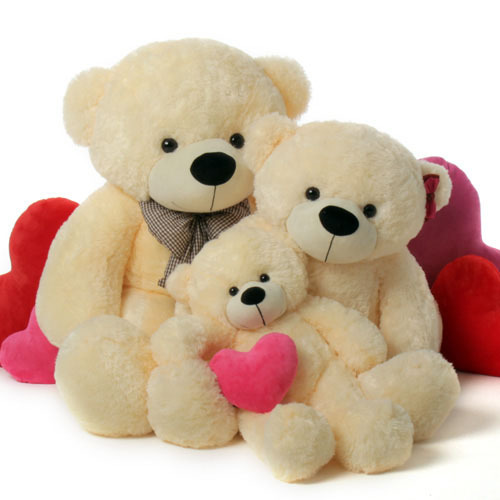 Each one has the Cozy Cuddles super soft signature vanilla cream fur and huggable, cuddly construction with hypoallergenic materials that Giant Teddy is famous for (safe for all ages.). Our adorable family of 3 bears is perfect for a new baby gift, to join your own family of 3, or just because they are so cute that you want to surround yourself in bears!